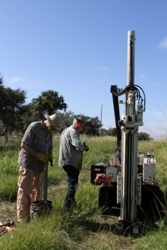 The Old Vero Ice Age Sites Committee sponsored a core boring project at the Vero Man site. 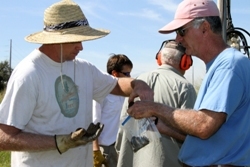 Archaeologists Dr. Glen Doran of Florida State University and Dr. C. Andrew Hemmings of Mercyhurst College in Pennsylvania led a crew working at the site. 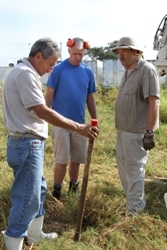 Using a geo-probe, the team put in twenty three new cores as the scientists continued the work of locating areas of undisturbed soil layers which can be further studied by excavation in 2013. 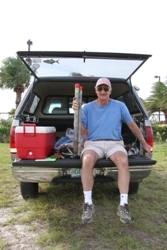 The cores will be analyzed at Mercyhurst College and the data added to earlier coring work done at the site in 2008 by Drs. 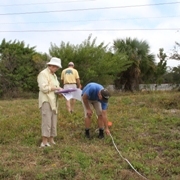 Barbara Purdy, Glenn Doren and Tom Stafford. 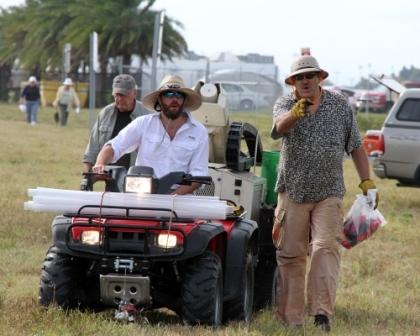 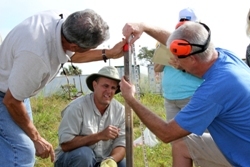 Archaeologists Grayal Farr, Ryan Duggins, and Glen Doren, Chair of the FSU Anthropology Dept., take cores samples at the Vero Man site.